Tomorrow, Sunday 2nd December, do come along to Mapledurham Pavilion for the Christmas Fayre between 10 am and 3 pm. 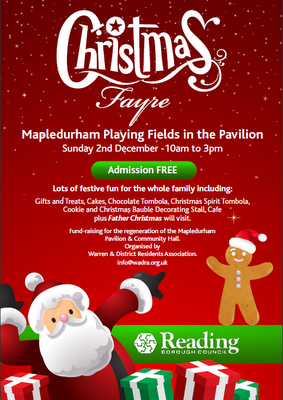 There will be lots of stalls selling all kinds of things including cakes, stocking fillers, plants and home decorations. Mulled wine and a BBQ will be on offer, lucky dip gifts on tree and bauble and biscuit decorating. Father Christmas is coming and children can have their photo taken with him. St Peter's Church choir will be singing at noon. So do come, bring your friends and family along and get into the festive mood!